This Mediterranean Pasta in a Creamy Feta Sauce started as a happy accident. Last week I was low on groceries and looking through my fridge hoping to find a few things to throw together for dinner. What I came up with was feta cheese, hummus and basil mixed together and melted over pasta. It was surprisingly good and I couldn’t help but think I was onto something. 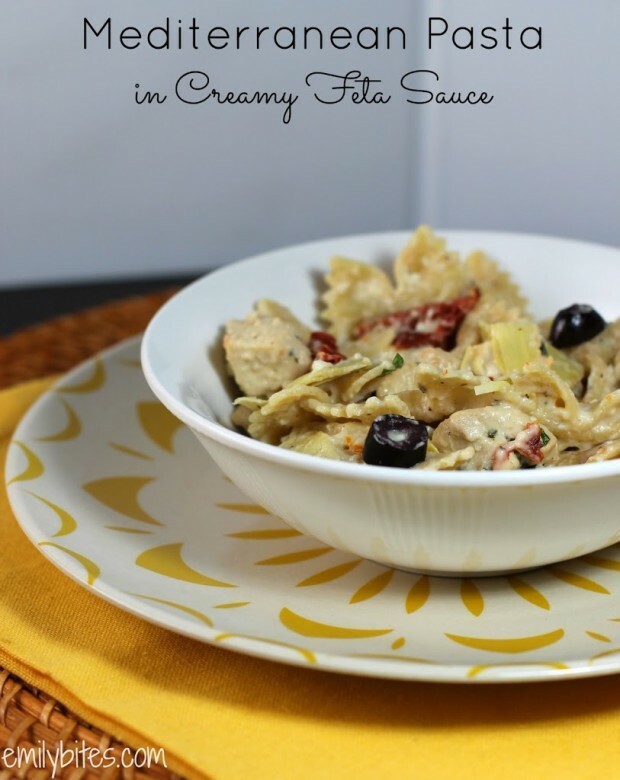 I’ve since improved it into a real recipe by adding the feta and hummus to a roux to make a rich, creamy sauce and filling out the dish with herbs, chicken, sun dried tomatoes, artichokes and calamata olives. Now the pasta tastes fresh, creamy, tangy, and full of Greek flavors. You may even want to squeeze a lemon wedge over the top for added brightness. I didn’t have one on hand but I think I might add a little spritz next time. This dish presents beautifully, which makes it perfect for serving company, a family dinner, or a comforting meal at home. 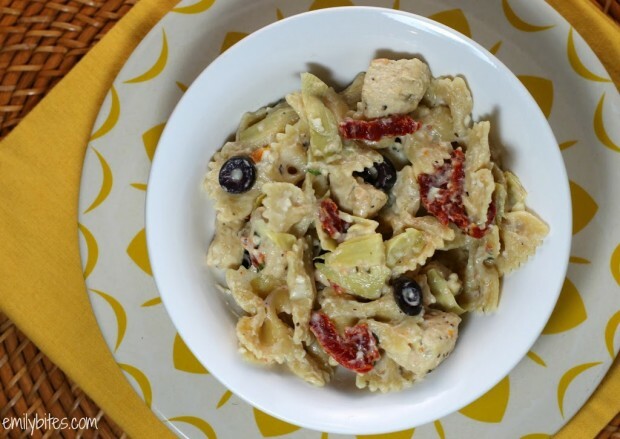 No one will ever guess that a filling portion of this chicken and pasta in a decadent, creamy cheese sauce clocks in at less than 350 calories! Don’t you wish all indulgences were this guilt-free? Bring water to boil in a large pot and cook pasta according to package directions. Drain and place in a large bowl. While the water is boiling in step one, bring the oil over medium high heat in a large skillet. Add the garlic, ½ t basil, oregano and rosemary and stir into oil. Cook for about a minute until garlic is fragrant. Add the chicken to the pan and stir to coat chicken with the oil and herbs. Cook for 5-7 minutes until chicken is cooked completely through. Add the chicken and any remaining oil in the pan to the large bowl containing the pasta and toss together. 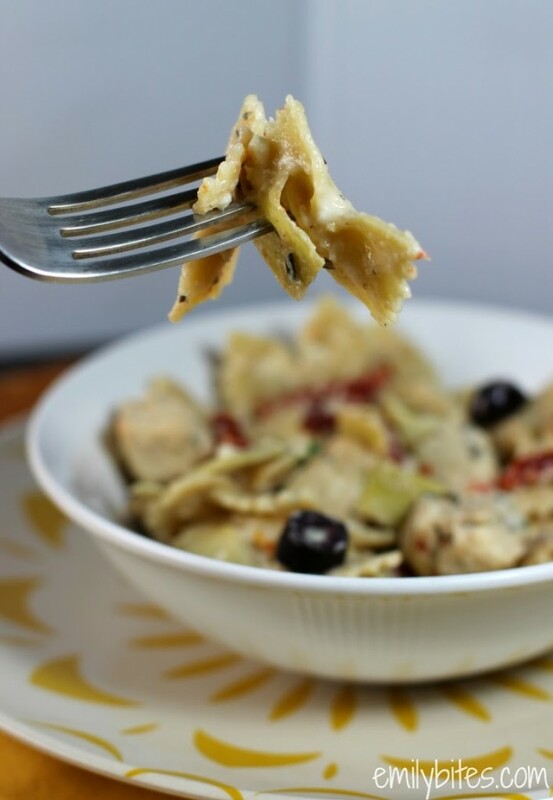 Add the artichokes, sun dried tomatoes, olives, and tablespoon of basil to the pasta and toss again until ingredients are combined and set aside. Melt the butter over low heat in a medium saucepan. When butter is melted, add flour and stir together for about one minute. Add the milk in slowly, whisking ingredients together until flour clumps are thoroughly mixed in. Raise heat and bring to a simmer. Simmer for a minute or so until thickened and stir. Add in the feta cheese and hummus. Continue to whisk ingredients until feta is melted and sauce is smooth. Pour the cheese sauce over the pasta mixture in the large bowl and stir together until well combined. That is 350 calories well spent! My old girlfriend loved anything with feta on it; she would probably drool over this. oh my gosh! I love all of these flavors so much! This sounds incredible! Definitely giving this a shot! Fabulous!! DBF is allergic to feta. Is there a good replacement or am I going to have to just make this for me, because it sounds delicious! I made this last night and it was awesome. Looking forward to the leftovers tonight. I just found your blog a few weeks ago and I am loving it! This tasted delicious and made so much. Thanks for a great recipe – will be making it again soon. Brought down the calories to 246 per serving with some yummy tweaks! I replaced the chicken with shrimp (20 for the full recipe, although I halved the recipe) and used cherry tomatoes instead of sun-dried. I sauteed a small amount of red onion and garlic, then tossed in the tomatoes. After everything got happy I threw in the olives and artichokes. Coated the shrimp in the same seasoning blend you recommended. Tossed everything together and finished with a squeeze of lemon and a tablespoon of capers. I finally got around to making this tonight, and it was delicious! Thanks Emily for another winner! Made this again tonight. This time I used chicken sausage instead of chicken breast (because I had it on hand) and it worked well. Really love this recipe! This was delish! I added the salt and pepper at the end for flavor- was that right? Is it really 98 points? or is it 9 points? This is the best pasta dish!! Similar to an entree I always order at Macaroni Grill, but with less calories. I couldn’t stop eating it. Great dish to serve company, with a salad and some good bread. Yummy! Thanks for thinking up that wonderful sauce.